An official publication of the British Academy of Composers & Songwriters, Heart & Soul offers unique access to the words and wisdom of the most successful songwriters of the last 100 years. Heart & Soul is an inspiring and practical guide for songwriters who wish to develop, promote and protect their songwriting craft. 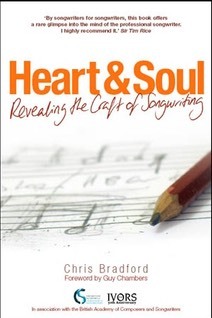 Heart & Soul contains everything an aspiring songwriter should need to know – from how to find inspiration; to writing effective lyrics and melodies; to breaking creative blocks; to essential information on the music industry and advice on publishing contracts; to the history and future of songwriting. Over 200 No. 1 songs have been written between the book’s contributors, making Heart & Soul the most authoritative guide to the craft of songwriting. With a foreword by Guy Chambers (Robbie Williams’ co-writing partner), the book features exclusive interviews with top songwriters including Rob Davis, Don Black, The Darkness, Wayne Hector, Billy Bragg, Billy Steinberg and Rick Nowels and also includes the first published UK joint interview with Holland, Dozier & Holland. The only songwriting book to be endorsed by British Academy of Composers & Songwriters, Heart & Soul was published as part of the 50th Anniversary of the prestigious Ivor Novello Awards.